Its weeks later and I'm back and recovered from my GCC trip (and a few more after!). 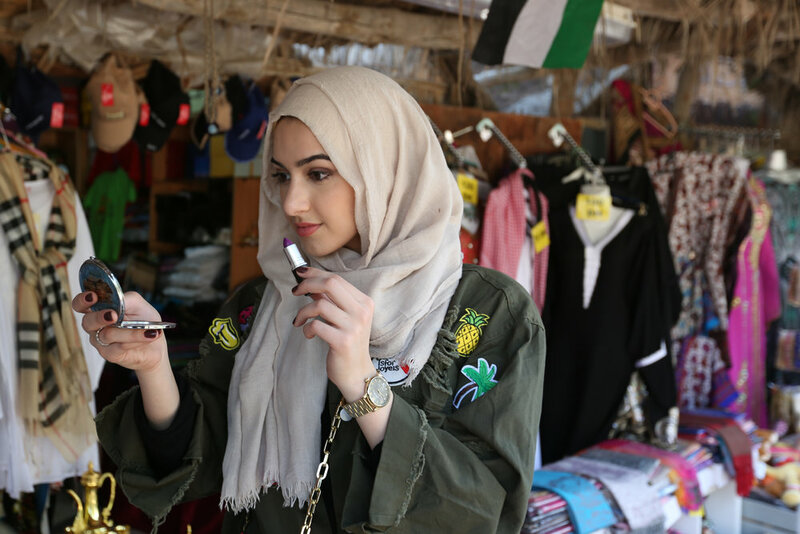 So, I'm happy to be sharing about my full day spent in Abu Dhabi last month with Tryano Store in shooting some of their new accessory and beauty products together! As you may have seen on social media, Tryano Store is the premier luxury department store in Abu Dhabi, located at Yas Mall on Yas Island. It's concept differs from most department stores, in its unique and colorful displays of all things accessories and beauty. Compared to most U.S department stores, this location was so beautifully aesthetic- it really makes the shopper feel relaxed. I began my tour of Abu Dhabi with visiting Tryano Store and touring the mall. Afterwards, we were on our way to the riverside, where the weather was just beautiful at this time of year. I'm wearing a red bag designed by Sandraj Handbags. In the latter photos, I'm carrying Tory Burch's new fresh splash fragrance being sold at Tryano Store. Next, we visited the Abu Dhabi Heritage Center, which was super cool to see. While in the UAE, you don't feel that Dubai is very culturally vibrant, so it was exciting to see the market goods and historical displays at the Abu Dhabi Cultural Center. I'm wearing a turquoise handbag by Hana Al Matrooshi, an amazing Emirati based designer! Afterwards, we visited the Abu Dhabi Grand Mosque, which was simply stunning. Although to be honest, the building did not feel much like a holy place, I truly did appreciate the beauty it displayed for its tourists coming from all over the world. From the white marble interiors, to the gold intricate engravings, its a site not to be missed when visiting town. A lot of the pieces I'm wearing in the shoot are made by UAE designers. What I especially love is that the regional designers are inspired by the beauty around them, whether it be the inspiration for gold detailing or palm tree engravings. Overall, thank you Tryano Store for the wonderful tour of Abu Dhabi! I can't wait to be back soon!